Getting to Hampton Court isnt that difficult, though we utilised the friendly Uber. Though if you are going to take public transport, it is pretty well sign posted at the stations and the bus dropped us right outside the entrance. If you are in need to find the easiest way as always we suggest the app citymapper. It has been a lifeline to us here in London – we really don’t know what we would do without it! Or double-check on Historic Royal Palaces website, they have some great information about getting there, what buses or trains to take and how long it will usually take too. Apparently, there was a discount to enter, between 3rd January – 17th February 2017 Hampton Court had half price tickets. Unfortunately, we missed this. Always keep an eye out for these discounts, or even better sign up to their emailing list and get an email when it happens – that way you will never forget. We paid the usual price which is £21 for adults, however, if you book online it will be cheaper. On selected weekends Hampton Court Palace hold ghost tours, sleepovers at the palace and other family activities. There are also guided tours daily – which of course we went on! The guides were dressed up as Henry VIII’s courtiers and acted the whole way round, great for information and kids. Free audio guides are also given out and can be used around the palace quite easily. WHAT EVENT WAS SHOWING THERE? 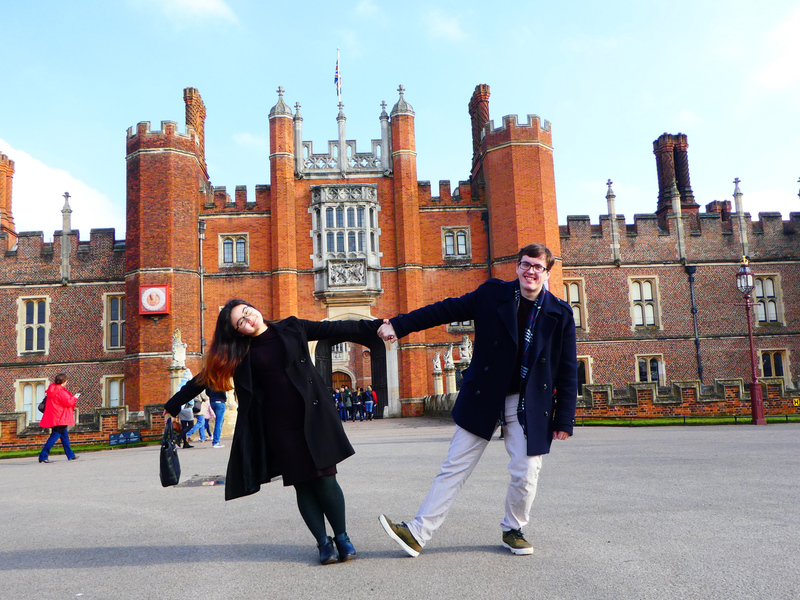 We enjoyed our trip to Hampton Court Palace but here are a few highlights of ours. The Great Hall, which almost takes you back in time to Henry VIII’s court, has the original Tudor tapestries that are the largest in Britain! Look out for the insignia for Henry and Anne Boleyn that was missed when all the others were removed and Henry VIII in the stain glass windows. The Chapel Royal is really a sign to behold, unfortunately you can’t take pictures (otherwise this would be an instagram dream), its ultramarine blue ceiling covered with gold leaf stars and cherubs. We were lucky enough to enter as a cello performance was happening and it was magical. Be sure to check out Henry VIII’s kitchens, the sheer size of the place is amazing and learning about the history of food and how it was prepared was actually quite interesting. They also have a massive fire running throughout the year, which in winter is the perfect place to warm up and we were told in the summer they cook on the fire too as it was where spit roasts were turned. William III’s apartments were much more of the traditional stately home or place that we were used to seeing with its long corridors linking room after room. The Guard Chamber decoratively displays over 2000 weapons, we never thought we would say that guns and spears looked pretty. In the apartments they also have a games room where you can try your own hand at two type of games that were played. Historic Royal Palaces also has an installation throughout the rooms of paper made outfits from the courts explaining who they were meant to be and what they did. Next time we visit we would like to see more of the gardens. We had a look around, even though it was pretty, during spring/summer all the flowers come out. We can’t wait to visit again and cross off more Historic Royal Palaces!